Are you happy with your current circumstances, or are there things you’d like to change? What if it were as simple as making a choice? In this interview, life and business coach Seth Ellsworth shares principles and insights that will help you get past limiting beliefs and achieve the life you want. 00:50 – You say it how? 11:28 – How do you see yourself? James: James Schramko here, welcome to SuperFastBusiness.com. Today, I’m speaking with Seth Ellsworth, and we will be talking about your belief system. We’ll see if we can make some connection as to how that’s getting you the results that you’re getting. Welcome to the call, Seth. Seth: Thank you James. Stoked to be here. James: Seth, it’s lovely to have you here. I’ve met you in Sta. Barbara at an Ontraport event. You are remarkably tall. That’s probably why your website is 610seth.com. Seth: You’ve got to say it right, man. You’ve got to say it right. 610, baby. James: Well you see, as a domainer, I do struggle with that domain because is it s-i-x-t-e-n? Is it 6-t-e-n? Is it s-i-x-10? Seth: That’s right. I bought both versions, to make it easier. James: Yeah, you know, basically, you’re committing yourself to multiple purchases with a domain like that. 610seth.com. How about that? James: And I like that your point of differentiation is hard to replicate. There’s a significant barrier to entry. Seth: That’s my one shining trait so I’ve got to milk it. James: I think you’ve got more traits than that. We’re going to be talking about one of them today. You’ve got a bug in your bonnet about limiting beliefs and the limitations of limiting beliefs. Can we talk about this topic? Seth: I will try to keep it civil and not rant too much. James: I don’t mind if you rant. I think firstly, let’s talk about why you’re interested in this topic in the first place. Why should I be interested? Why should the listener be interested in understanding limiting beliefs? Seth: Well, first reason for me is that I care. I flat out care that people actually get results and move forward in life because I know how bad it hurts, especially as entrepreneurs, when we feel stuck, or stopped, or that we’re not getting traction or we’re not moving forward. A lot of times, limiting belief comes up as a thing that we blame for it. So I deal with this a lot with my clients, and it’s pervasive. I think it’s actually an addiction, which we’ll talk about. James: Well, let’s clarify then. What are we talking about specifically when we say limiting beliefs? We should just put a border around this and say this is what we’re talking about. James: So an example, if we were a copywriter, then we might say we have writer’s block. James: OK. I can relate to that. Seth: There’s something blocking them. You can go to limiting beliefs to the depth that I’m scarce minded, the world is scarce, there’s not enough for me, I’m not successful, I’m not worthy enough, I’m not good enough. All that kind of stuff in the same bin. James: I feel a lot of those things are programmed into us, mostly by our parents and our environment as we grow up. Don’t ask why, we can’t afford that. I’m not specifically talking about my mum and dad. So mum, dad, I’m not talking about you. I’m talking about regular parents who, they just parlay their thoughts and ideas onto the next generation. And that’s why we get such a big lottery line up when there’s a huge payout, because people have limited the idea that they can achieve what they want through ordinary means so they need to have the extraordinary lottery win is their strategy for wealth. I almost feel a little bit sorry for those people because to me, that’s an indicator. That would be the litmus test of saying, “Hey, you have limited your thoughts about what you can do without winning the lottery.” Am I on the right track here? Seth: Yeah, 100%. I mean it’s completely limiting. Let me give you an example. There was this poor gal in this online mastermind group, that threw up a post, which is, “I feel really stuck. I think I’ve got these limiting beliefs. How do you guys deal with limiting beliefs?” Boom! 300 comments. James: So that’s an assumption that there is limiting beliefs in the very first place? Seth: That’s right. That’s right. And limiting beliefs, call them what they are, they do exist, and they are a very real thing. But we give them too much air play. We give them too much play in our minds. And bless her heart, she was super well-meaning and she feels really stuck. But she was then littered with 117 different ways to get rid of her limiting beliefs. Going from somebody that feels overwhelmed and stuck, giving them 117 different ways to fix it, what does that fix? Absolutely nothing. So she feels more stuck and more worthless, when really the problem isn’t her limiting beliefs at all. It has nothing to do with that. So there’s an entire industry built around limiting beliefs. And if that’s your industry, this may be offensive for you, where I go with this, and I’m fine with that because we need to rewrite the freaking script right now because everyone is stuck. If you think that your beliefs are limiting you, you’ve got problems. You know why? Because your limiting beliefs are actually the symptom. The symptom, not the cause. So if you ever label a limiting belief as the cause for anything, you’ve got problems. And you will never be to the end of that problem so long as you don’t realize that it was a choice that got you there in the first place. James: So this is about looking in the mirror and taking responsibility? Seth: Yeah, but it goes a little bit deeper than that. James: Let’s go a bit deeper. I’m curious now. What are the causes? Seth: So we’ve got to look at what causes belief. Everybody thinks that you’ve got actions, you’ve got beliefs, and how they’re intertwined, etc. No, it goes deeper than that. It goes to an identity level. 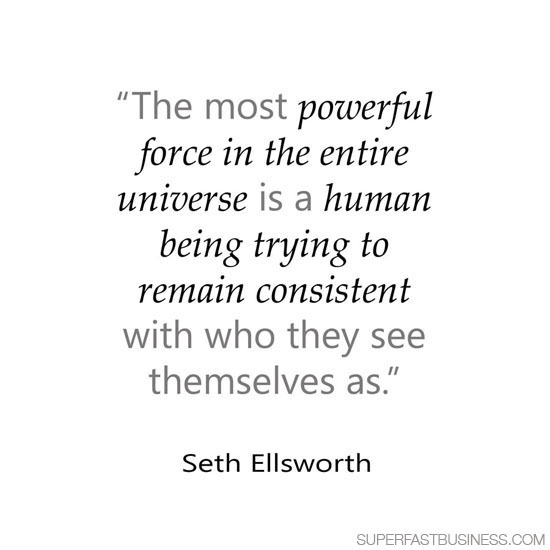 The most powerful force in the entire universe is a human being trying to remain consistent with who they see themselves as. Period. That right there is enough to create powers that change the world. But it’s also enough to destroy you. So if how you see yourself is a poor person, you’ll be a poor person. If how you see yourself is somebody that wakes up in the morning and rocks their morning routine, that’s what you’ll do. Your body, your mind, everything that we are given by the higher power is to help us stay in alignment with who we are. So here’s the thing, limiting beliefs are a result of how we see ourselves. Not the other way around. Your beliefs don’t create who you are. So you go one layer deeper. All you’re going to find, James, is choices. That’s all you are, is a pile of choices in your life. That’s it. There’s nothing else. The only thing unique that you have to give to the world is the choices you make right now. So here’s where I go with this when I talk with clients about this very issue, and it shatters their entire paradigm of what they thought they were. And it’s so powerful but so stupid simple, anybody could understand this. What creates beliefs? What creates identity? It’s choices. So go with me on this. Everything that you believe you are or if you feel or that your paradigm for your existing, all your beliefs, whether they’re limiting or not, they originated in choice, whether that’s your choice or the choice of your parents, or your friends, or your cousins that shaped you, you’ve got two things: you either choose to believe it or not. Either give up your choices or you make one. Either one of those is a choice. So everything that you have created, that you feel you are, that you’ve been through, has caused you to make a choice on some level. And that choice becomes the seed for how you see yourself. You see the relation there? James: I do. It does fit with some of the things that I’ve been exposed to in the past. I remember Maxwell Maltz talking about humans being a goal-seeking machine. That fits quite nicely with what you’re saying that we keep tuning ourselves to be the person we see ourselves as. I remember Brian Tracy’s sales training, Psychology of Selling. It was saying if it’s meant to be, it’s up to me. That’s something that I teach my kids, and that certainly implies the self choice that we can choose to make something happen. Seth: Absolutely, in any moment. And what we have chosen has created us to this point. James: I love the “believe it or not” part because that’s where it fits so beautifully with my concept of questioning everything, question everything. Because we’re fed stuff. If you see documentaries or you’ve observed any religion, you see entire masses devoted to a belief system that in many cases has never been questioned or challenged, it’s just accepted and brought in without any filter. And I remember one mentor of mine was teaching me about how to read books properly. And he said, “Just keep in mind that a book is generally one person’s opinion.” So it doesn’t mean you have to agree with it or that just because he wrote a book that he’s the supreme authority on it. You could find 10 books with 10 different opinions on a similar topic. It’s up to us to decide which ones we accept and which ones we reject. Even this very podcast, someone could listen to this and choose to accept your concept or reject it. That’s the fascinating thing about this. It is a very deep subject. Seth: But it’s also extremely simple. James: So if we decide that it’s choices, that it’s the choices we’ve made and choices that others have made on our behalf, I can’t help but think of a Coca-Cola billboard or McDonald’s advertisement on TV that’s like someone’s telling us what choice to make, whether we accept or reject that. Knowing this, what’s the next situation that we should be talking about? Seth: So here it is. In life, like this poor gal in this group online, she posted this, she’s not aware of her choices. That’s her problem. It’s not that she has limiting belief. She feels stuck because she doesn’t see options, she doesn’t see her choices. So here’s how simple it gets. The only thing that you have control over in this life is choices. That’s your point of creation always. From there, you choose who you are and who you’re going to be. This is so powerful. It is difficult to describe how powerful this is when the light bulb goes on in somebody’s life and actually apply this. When you make a choice on an identity level, that becomes a superhuman power that you didn’t even know existed. Why? Because your identity holds the ticket for all of your thoughts, all of your beliefs, and therefore, they result into actions. James: So are you talking about self belief here? Seth: Absolutely. Not just belief, self identity. Seth: Of choices. So we go from choice to identity, which then begets the thoughts, beliefs and actions. So this person that was stuck, if she really wanted to change her life, she would go to the core choice to change who she sees herself as. Here’s the magic. When you go there, James, which by the way, freaks out the normal human because it’s somewhere they’ve never been and they’ve never gone before because they didn’t realize that was available to them, to go there. But you go there and you literally stare yourself in the mirror and realize that you’re not looking at yourself. That there’s somebody deeper and more powerful that you’d not even awakened yet in your life, and he has the ability to make choices on a level that you didn’t even understand. You can choose to be, right now. And the result of this, James, is that it doesn’t freaking matter what the 15,798 limiting beliefs are that you have, because as soon as you change the identity, what must change? The result end forces, which are your thoughts, your beliefs, and your actions. Because we’ve got that thing that the human beings have, which is the strongest force in the universe, which is we want to maintain a steady course in alignment with how we see ourselves. So you change how you see yourself, you change everything else. Period. James: Yeah, this is good. I really like the progression there. 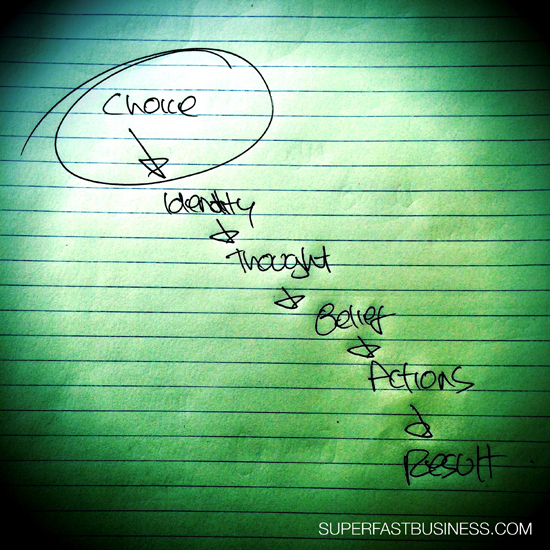 Choice, to identity, thoughts, beliefs, actions. And I imagine after that comes results. James: So, I got an entire podcast on this very subject of thoughts, actions and results. It’s called ThinkActGet. And it goes way back to, I registered that domain a long time ago when I first started online. It was because I’d learned about ABC: activator, behavior, consequence. And what you’ve done is take us a step before the activator and that is the choice part and the identity part. I really like that. I was only recently revealing a story to my listeners about when I attended a personal development workshop at the workplace that we had. And there was this mechanic and he was almost at retirement age and he just had this epiphany and broke down into tears just because he actually never realized that he had a choice. All he did was go to school, then do an apprentice mechanic job, and then become a mechanic, and then become a senior mechanic for his entire life. And he’s almost at retirement and he never realized that he could have chosen something else. He never gave it a single thought. That was the most profound thing I’ve seen as awakening, to say, you know what, if you want something different, it’s possible. You’ve just got to think that. You’ve got to make the choices. And everything we have right now is the result of all the choices that have come before us, right? Seth: That’s right. That’s right. And there’s different levels of choices. The kind of choices I’m talking about are the ones that create turning points, the massive choices. Those are available to you anytime you want them. You don’t have to be the Michael Jordan who’s cut from their sophomore basketball team to figure out that you want to be a basketball player. You don’t got to be the Charles Barkley that didn’t graduate with his high school class and went under the stands and cried to take control of your life and say that you’re not ever going to leave your destiny in the hands of somebody else. You can make those choices any time you want. You read biographies. Almost every biography you read, there’s always a massive turning point where something just radically changes for that person. James: Yes. And I watch documentaries all the time and it’s fascinating. Seth: It’s almost always a choice. That’s it. That’s the crux of it. James: Well, even sometimes they explain it as being, it just happened or it’s serendipitous. But even then, you’re still at a crossroads to embrace it or reject it. Seth: Absolutely. It’s interesting, the result that this has once people believe that they can choose on a different level. It breaks them wide open. The trend of limiting beliefs, obviously they exist, they’re there. And when you clear them out, it just feels better. But here’s the best analogy I’ve ever heard about this issue. So if I’m cleaning my house and there’s cobwebs in the top right corner by the door, I’m not going to feel like my house is clean until those cobwebs are washed out, washed away. So the cleaning lady can come in and she can clean out the cobwebs. But if she doesn’t kill the spider, you haven’t fixed the problem. James: Well, she shouldn’t kill the spider, just quietly. Seth: Not quietly. Should smash it. James: No, the cobwebs get all the insects and mosquitoes. They are friends. Spiders are great. Seth: See, now you’re doing your contrarian thinking here. James: I’m looking at some cobwebs right now in my balcony and that’s the net trapping the mosquitoes and some others, stop me from getting stung. Seth: So you’ve got bug problems in your world. James: Well, no. It’s just in Australia. We live amongst them so it’s an interesting metaphor. But isn’t it a good example? James: But it’s an example. We can make a choice. You see a cobweb and I see a cobweb. Your choice will be to annihilate the root cause and my choice will be to embrace the natural insect killer. So we both made a different choice around the same item and we both get a different result. James: I have to look at cobwebs, however, my body’s safe from nasties. Seth: That’s awesome. So obviously the idea’s there, you can clean out the cobwebs but they’ll come back if you don’t kill the spider. James: Exactly. If we want to put into a metaphor that everyone can relate to is your inbox. You can clear out your inbox, but sure enough, it’ll be full again next week, unless you go back to the real reason, which is the fact that you signed on to everyone’s email list in the first place. Your habit of acquiring is going to cause a deluge in your inbox. And only when you stop turning on subscriptions will you stop the influx. Seth: And you know what, those emails are just like limiting beliefs, oh my gosh. Seth: They’re so many of them. They’re so overwhelming. There’s just so many and they keep coming back. There’s so many. I don’t know how to stop it. James: Your inbox, it’s the to-do list that other people get to add to. In other words, you made a choice to let other people choose to tell you what to do or to tell you what action to take. And only when you make a choice to reject, giving them the choice, do you free yourself up from that. In fact, we know several people who don’t use email at all. They chose not to bother with email. And they’ve had other people manage it or they just don’t deal with it. They don’t reply. In fact, those people, you know not to ever email because they’re not going to reply back so they’ve actually created a self-fulfilling prophecy with their choice. Seth: Talking about the Dan Kennedys of the world. James: Dan Kennedy is a classic, still uses faxes. Seth: I don’t have a fax machine. I have to do that digitally, too. James: Who has a fax machine? Seth: You have to have an email address to use a fax nowadays? Seth: It’s just silly. So here we are in this scenario where we’re all caught in this idea that we are our beliefs, which is so not true. The idea that a belief is limiting is the limiting factor. Period. If you believe it’s limiting, it will be. And so your mindset on that issue, you’re stuck looking at a symptom and thinking that that symptom is you. It got nothing to do with you. Not really who you are. You are a thinking, warm-blooded human being that has the ability to choose. You command those beliefs by who you see yourself as. It’s incredibly powerful and it’s incredibly limiting. So what kind of stuff does this do in people’s life? It creates miracles. I don’t really know another word to describe the stupid, crazy stuff that happens when people figure out that they can change who they are by just a simple choice. You get habits that people have struggled with their whole lives, installed like software. It’s the craziest thing ever. It happened to me. You get things that people struggle with and their mindset where they’re not believing they’re good enough. All of a sudden, they’ve turned professional, they’ve turned pro. In their mind, they use a Steven Pressfield phrase, and now they’re professional. I’ve got one story that’s just amazing. This kid, who has never been in a… Can you rewind? This is great for the listeners. If you rewind to where you tip the scale from an employee to an entrepreneur, I know some of you probably just grew up as entrepreneurs, but a lot of us made the transition. I know you used to work for Mercedes-Benz dealership. There’s a transition period where you’ve got to level up your mindset, turn professional, in order to be worth anything in the free market. Imagine rewinding to that mode, jumping into the entrepreneurial world, and not being sure of yourself, not being sure of your business, not being sure of your value. I had a client one time who was four months into that scenario. He was just working a job, previous to four months, but bless his heart, he worked like a champ. He was already making $2,000 or $3,000 a month, on month four, which is pretty good. He’s going fast. So he does an American Express gamble and hires me to teach him with the mindsets issues that he had. Month two, we 10x-ed his income. Didn’t change anything in his business. Nothing in his business, 10x-ed his income all because he changed who he is. That’s it. Shocking. Change nothing in your business and everything changes. That’s the kind of choices I’m talking about. That’s not a one-time occurrence. James: Well, you asked me to rewind and I had that exact experience. For me, it was benchmarking. It was one way that I was able to make different choices. It was sitting beside people who were achieving significantly better results than what I was, which made me reappraise what standard I accept for myself. So it was a choice to no longer accept. Like I went from a point where I was earning $300,000 per year, sitting next to people making $100,000 per month, and then reappraising my scenario. You’d call it a reframe in some context. I went from thinking I was doing OK to thinking that I was playing too small a game and ripping myself off. A decade later, generating several million dollars per year, my new standard is the bare minimum compared to other people’s maximum. It’s wildly different. I can feel it when I’m circulating society. I’m living a very different life than most of the people around me, but with the same resources and tools available. In fact, the main resource that we all have available to us is 24 hours a day. Everything else is up to you. Seth: 100%. You said something that’s really important, is that you chose a standard. So there’s different types of choices. One could be you choose or you refuse, you make a choice to refuse to accept XYZ. You level your own playing field to whatever level you want to play at. Another type of choice is where you choose to be something that is at a higher level. Two different choices, both of those together are incredibly powerful. James: So that’s choice stacking. Seth: That’s right. You’re a perfect example of that. James: I think one articulation that’s worth mentioning is that when I’m aware of something, I usually work hard on crafting the right question to move myself out of it. I guess question must be in somewhere related to a choice. By choosing a good question, I can develop a better answer or prescription. Seth: And the answer itself is it can be a choice. James: Yeah. I think a lot of people are answering a question that’s the wrong question in life, like they revolve their whole existence around money, for example. So they’ve made a choice to make money the center of the universe when I’ve discovered that that’s not the center of the universe for me. So I’ve chosen a different importance, a different factor to place value on, which means that my entire universe is spinning in a different speed than other people. And every possible choice along the way, when you use a filter, one filter could be money, another filter could be happiness, for example, then you’re going to have different results. Seth: Level up. It’s interesting to say that. I mean people are, like this gal, we go back to the gal, the gal that posted the thing that got 300 plus comments and is still being commented on, by the way, this was yesterday that she posted this, it’s amazing, the response. But you’ve got to level up to a new playing field. I’ve got this saying, “new levels, new devils,” or “new heights, new frights.” Whenever you do that in business, you’ve got to level up how you see yourself. Otherwise, you’re going to always feel like you’re chasing. So for example, the young man that just finally quit his job four months into it is just now getting started. He needs to level up in order to get to six figures. Well, what happens when he gets to six figures? Different choices, more choices, more expensive choices. It’s a different playing field. What happens when you get to seven figures? It’s the same thing. Different problems. New levels, new devils. All of that requires new identities. But most people’s approach to it, James, is that once they get to that point, they think it’s all the limiting beliefs. Once they get to that point, they think it’s because they’re not good enough, not this and that, and so they start chasing rabbit holes. “Invisible rabbits down endless rabbit holes” is what I call it because they will never be to the bottom of their limiting beliefs. James: So to simplify it all, even with this lady in her Facebook thread; firstly, it’s a choice whether you want to be on Facebook at all, and I certainly choose not to be there very often just because we expose ourselves to everyone else’s opinion and most of them aren’t qualified to direct me in my life. That’s a choice I’ve made. Secondly, she could choose to apply a mental model to the answers. She could use an 80/20 principle. She could use a qualification methodology to work out, of the people who commented, are any of them qualified to answer her, if any. And then of the people who are, which ones does she want to place some weight in, or none whatsoever, just to reduce the overwhelm. For someone like her, you could use a metaphor of a library. She might say what’s a good book to read, and everyone might have their opinion. But generally, you’re going to pick one. You might use a review system, you might ask a recommendation from the person with insider knowledge, like the librarian, you pick the one and walk out of there and leave the rest. You know you can go back anytime. Seth: So here’s how simple it gets for her. This is what I would do in her case. If she were to talk to me, I would point her directly at the person that she really wants to be and show her how to make that choice. And all this limiting stuff will just melt. Period. And then I would push her on her way because she would be just fine on her own versus pointing her towards her limiting beliefs, etc., etc., etc., which, who knows how many rabbit holes that will bring her to. James: It’s so close to the advice I’ve given to people. I just say this, that the only tool that’s useful here is just a mirror. Pull up a mirror, stare into it, have a look at the person staring back at you, that’s the person who’s responsible for everything that’s going to happen, and you can basically have a conversation with yourself. I think that’s probably my way of saying you can choose. Seth: You know how scared people are of doing that, James? James: Oh, I think, like I learned with that mechanic. A lot of people, a) they don’t realize they can make a choice, and b) they don’t have the courage or the self-honesty to have that conversation. It’s much easier to hide. It’s easier to be busy on Facebook or to avoid confronting the reality. I know guys like Dan Sullivan talk about the fact that if you can be more honest with yourself, you’re going to get better results as an entrepreneur. He talks about the 4 C’s: Commitment, Courage that builds Confidence and then gives you Capability. I think that’s a nice framework. Another question that I ask people when they’re struggling is a simple question. It’s, what result do you want? And it sounds a lot like what you would’ve said to that Facebook lady, like who do you want to be? You’re just directing her back to the start of that hierarchy, the choice part. Seth: Who do you want to be? James: If you want to be that person, you can choose to be that person from now and move forward. Is that really the action step from this podcast? Seth: Yeah. I mean, that’s, you choose to be that person. So once you make that choice on an identity level which, coincidentally enough, I’ll show you guys how to do coming up, once you make that choice on an identity level, all this stuff, you get to write your own script, and you create in your own life that force that we talked about, which is your desire to remain consistent with how you see yourself. That is your vehicle that you hop in and you go. Limiting beliefs don’t matter at that point because you’re going. James: This is great. So I’m going to throw a net around this whole episode and wrap it up. We’ve talked about that people often come up against something that they identify as a limiting belief, but that’s really the symptom, it’s not the cause, and it’s because they’ve not got a better of thinking about it. We talked about the idea of this hierarchy that your choices drive your identity and the identity drives your thoughts, which drives your beliefs, which gets you actions, and then you end up with a result. So go back to the root of that choice. The fact that we are wanting to be consistent with how we see ourselves, so therefore, we should make a choice about how we’d like to see ourselves and then do everything consistent with that. Am I on the right track? Seth: You’re a very good listener, James. That’s pretty impressive. James: So, what we want to do is we take the whole interesting thing here. I’m sure as we’ve been talking, our listener will have been thinking through and how this applies to themselves because that’s what we do. We reflect on everything, we selfishly insert ourselves into the conversation out of our survival mechanism. We think, does this apply to me or not? I’m imagining there’s someone who might be a little bit down on finances, a little bit overworked, a little bit overwhelmed, got a lot going on, they might be in a place where they feel like this could be out of reach. But I think the metaphor that comes to mind is no matter how dark a room, even a tiny little candle can defeat darkness. So the tiny little candle we’re offering here is Seth’s fantastic miracle cure, is to go back to the choice. Just have a look at the choices. Even have a look at the choices you’ve made today and see how th at might have got you what you’ve got and where you’re at. If you decide to make different choices from now, you can interrupt the projection of your life in a dramatic way. As Seth was saying, it doesn’t have to be just a little bit of an increment. It could be 10x. It could be 100x because tomorrow is a brand new day and you can start with new choices, whether that’s small choices around changing the way that you move or eat, or the communications you have with people or how you want to interact with social media or whose email list you’re going to sign up on, or which product you’d like to create. You can choose to be whoever you want. Seth: Absolutely right. 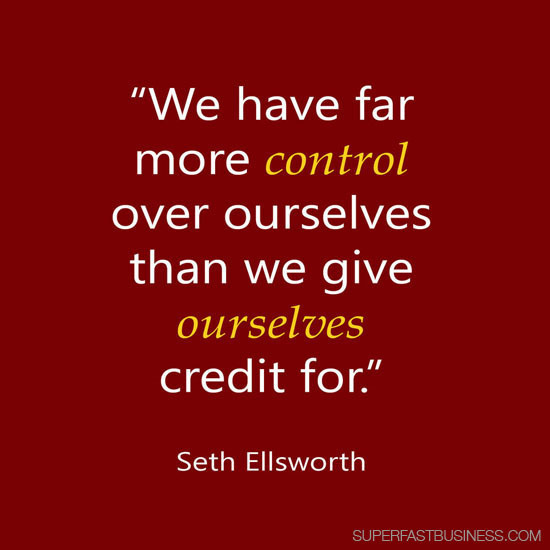 We have far more control over ourselves than we give ourselves credit for. Sometimes, that’s intimidating, but you need to stop and realize that nobody’s taking your choices from you. That’s the very thing that creates and destroys in your life because all you are is a pile of your own choices. Period. James: I love that quote. 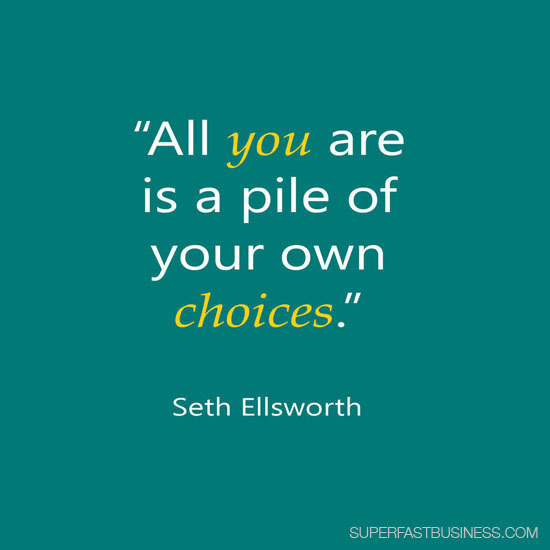 You’re a pile of your own choices. Seth, you’re going to come along to SuperFastBusiness Live, and you are going to offer a 3-step system to make any choice you want. Is that right? Seth: I’ll go one better than that. So let’s say that you come to SuperFastBusiness Live, and you’ve got this thing, this change you want to make, this thing you want to install, this thing you want to do, I’ve got this principle called Breakthrough Momentum, which I’ll explain there, and I’ll give you the three steps to make any choice you want, but put it on a level of identity that does what we talked about, that changes everything else. It rewrites the script, it reprograms the mechanism. Let’s say that your morning routine is something you struggle with. You really know what you want to do but you just can’t get yourself to do it. Make it that easy. It’s three really, really simple steps that I can’t wait to share with you. James: Well, I’m really looking forward to that, that’s why I asked you to present at the event because I am certainly a strong believer in the concept that most of what we’re doing online in our business and in life is just all mindset. It’s so mindset driven. James: I was convinced of that from the first time I listened to Maxwell Maltz in the Psycho Cybernetics. James: You know, with this idea that we’re goal-seeking devices, that we can visualize good outcomes in advance. It so fits with what you’re talking about. I’m very grateful that you came along to share these ideas. I know we’ve wandered around a little bit on this particular episode. And it’s not as easy to define this as AB split test or some of the other technological subjects we cover. However, I think in terms of waiting, it’s by far more important. So thank you, Seth, for sharing with us. Seth: Absolutely welcome. I believe, James, that this, the crux of this issue, the guts of it, is the very most important thing that we could ever pay attention to and do for ourselves, is give ourselves the freedom to make choices on a new level. James: And as you said in the beginning, you do this because you care, and I think that is being a good human. Seth: You as well, my friend. James: You’re a good man. Really enjoyed this episode. Looking forward to Seth’s presentation at Superfastbusiness Live. This episode resonated with me so much, which internally for me, relates to the deciding of something before you start “the choice”. After my 3rd listen..To me “Seth’s fantastic miracle cure”, is actually part of what values you hold important. Before the pile of your own choices, lifestyle design and “Value placement” needs to be decided, and maybe thats the point. At my first job, I too was a 20 years old employee reading Maxwell Maltz “Self-image sets the boundaries of individual accomplishment”. Now- How this turns into a transition to stepping up in success is the real quandary. This begs – what is success? Ex- I was looking to go apple picking at a farm this weekend, i was thinking, how nice it was to be able to have the luxury “to go apple picking” when’s its actually someones job! Then i was looking at who owns the farm, and the owner was recently unsatisfied because he could not own the “Celtics” the local NBA team, so he had to buy one out of state for $500M! Anyway, transitioning your values seems to be the message, thats why this podcast has given me the transitionary fuel to rebrand my tagline on own podcast where I have been plugging “step up” as the central theme to choosing the responsibilities to transform your life and business. Great way of putting it in words that resonate with you. Values play a huge part of this in my equations and frameworks I use with clients. Interesting perspective. The question that came to my mind after hearing the word “choice” so many times was: what causes a person to make a particular choice? I feel that there’s a layer that comes before choices, which would be the emotional layer. In my opinion, emotions are what trigger a choice, and if your emotional self is unbalanced, that can lead to a limited way of seeing yourself. I believe that by working on your emotional self you would put yourself in a better position to make more positive choices in life. Mindset is important, but your emotions affect your mind. When you get to the bottom of why you feel the way you feel and then release those negative emotions, you’re able to focus attention on your mindset without any negative emotional distractions. That’s interesting Vernita, I’ve come to a place that I believe you can control your emotions or even, my earlier belief was that you don’t have to let your emotions control your decisions. Ultimately, your emotions are a symtom of your beliefs, whether positive or negative emotions. Yes, I agree. You can disconnect from the need to feel emotions and be controlled by them. Emotions are absolutely a symptom… but of what? We can’t just say “beliefs” because that is not the whole story. It’s a funny word. There are different levels of beliefs. CORE beliefs, which is synonymous with identity, is “how you see yourself” All emotion is rooted in that core belief, or identity. Those types of choices are not the ones I refer to. Those are typically circumstantial and reactive to environment. Changing at an identity level can be very risky business, it’d be interesting to see Seth’s three step technique and whether it’s actually lasting change or just long term change (making the cycle longer lasting than higher level change. A higher level change might be changing ones environment or changing ones behaviour or changing ones beliefs. I wonder how many cycles of Seth’s three step technique one would generally need for the change to be ever lasting. I am guessing one. Like when an addict chooses to stop. True. When it’s identity level change, it’s ever lasting, so it is just one, however done in a “3 simple steps” makes it curious as to whether it is actually ever lasting. I’ve been in discussions when the theory or education on this type of change says that usually, when there is instant noticable change, it’s not lasting and the human circles back at some point, but may only circle back to a lower scale of the problem as they were before, not as bad as it was. In many cases, when there is huge change in a seemingly instant the human at some point, instead of going through a cycle coming back, the spring back like a rubber that was being pulled to a stretch and then the tension is released. If Seth is claiming instant change with these 3 easy steps, then this teaching might say that it is short term change, which many coaches work on because the client will see the results instantly and keep coming back for more coaching sessions. The best way to create ever lasting changing is slowly, that way one can create a change that ever lasting so that the person can be caught in the cycle and also be coached through the self sabotage which can sometimes ambush the cycle and cause the spring back. Put in simple terms, any instant change is temporary. I was curious about whether the change was just temporary too. I feel as though the only way for permanent change in how you see yourself you’ve got to do some very deep inner work that goes back to childhood and what you were conditioned to believe. We all have been conditioned (both consciously and unconsciously) by people and environment from the very moment we are born into this world. There needs to be a release of supressed emotions and a process of breaking free from the conditioned mind in order to permanently change what we identify as. I don’t feel like it’s one or the other, but both. My personal definition of a belief is when the heart and mind agree with each other. When it comes to a belief they tend to feed off of each other. There needs to be both mental and emotional work for permanent change, and that takes time. Sorry I had missed this conversation Bernie and Vernita. Great questions that are in line with the current personal development landscape. Which is totally fine and normal. People have been doing it that way for a long time and you are welcome to continue that path. I just don’t have patience for slow and hard when it doesn’t need to be that way. Fast and permanent. The change can be small or large. I start with small, always. The capacity to consciously direct a life increases over time. I am curious what makes you believe it is risky business to make choices? You identity is created by choice, how else can it be changed if not by choices? The part that is missing from what was described is this: if you fundamentally change how you see yourself, you can’t actually go back to who you were. Not possible. Because you will be 100% conscious of it. The expansion of self can be uncomfortable at first and trigger things to happen. I calculate for this. Always. And also make sure clients avoid that trap through very very simple mechanisms. I am not interested in flash in the pan change. I am however interested in teaching something so simple that anyone can do and I therefore work myself out of a job. The phrase “choose to believe” is everywhere. You can choose to believe whatever you want. You an believe me or not. Up to you. Choice naturally comes before any kind of belief/action/thought. But I’m talking about choices that dig much deeper than that. 1) yes permanent change can be instant AND scientific. The most successful way to quit smoking is what? Cold turkey. Nothing beats it. Not even close. And those that fail at it, know they weren’t fully committed (yes, people have used this simple process to quit smoking of their own accord although I don’t teach this for addiction, etc). Certain conditions exist in order to enable that choice to quit smoking to stick permanently. The change lasts if it is attached to how you see yourself or your identity and given cause to grow/solidify. So yes, it is lasting if you do it right and are committed to the choice. Right choice. Right time. Right way. 2) yes it’s simple to maintain. 3) no they aren’t really “steps” they are phases that must exist in order for the change to be meaningful and lasting (on an identity level). As far as steps go, there is only one. If I misspoke that is my fault. I’ve since stopped calling them steps. 4) changing your beliefs will not change your identity. That is a lie. You cannot put a bandaid on a cut and somehow heal the entire organism. Change does not take time, it is not complicated and hard. Its simple and fast with some moments of intimidation only because it takes commitment to create change on a level that I speak of. It is flat out uncomfortable for almost everyone I’ve ever taught it to. I have done this over and over and over again with people. This is what I do. Up to you to choose the simple way or the slow/hard way. Everlasting doesn’t exist in this world. We are always changing. When you do things in the way I describe you will hit “levels” of change where one trait/characteristic/action/virtue etc is more valuable to you. Once you grow above it, something else becomes more valuable and receives the proper focus. There is no straight or flat line when it comes to identity based change and growth. That’s the beauty of it. You can put on an identity like a shirt if you want and take it off when it gets hot outside. SO FLEXIBLE. How? Because you are the puppet master. You pull the strings and make yourself dance in ways that you choose. “Any instant change is temporary” is not true. Might have been your experience which is possibly limited by your own belief and experience. I speak of change that happens consciously, on purpose and with purpose. Change that gets RESULTS and is simply maintained. But you are right, it must be maintained. Not time enough on the podcast to go over all of these scenarios. We don’t just make a choice and then expect that magic happens and everything is instantly perfect. We must maintain by choice what we created by choice. How to do that is also incredibly simple. Takes just 5 words. If you would like to reach out, feel free to do so. We can put these common concerns to bed for good so you can move forward faster. Really enjoyed this one – thanks Seth and James. I finally listened to this after loving Seth’s presentation at SFBLive. I love it, it is so simple once you see it that way. You are who you choose to be. Nothing environmental can actually change who you are, it is purely your choice to be affected or not by the things around you and be the person you want to be. Also I love spiders, I much prefer having cobwebs in the house rather than insects! hahaha.